Empower yourself with File compare tools from Softinterface. Need MS Word/Excel, PDF, Text, RTF or HTM file comparison? See the 'Diff Doc'™ tool also. I compare two different documents, yet it reports no differences? What can I do about lines of text that are not aligned properly in the comparison? How can I print/e-mail/save the results of the comparison? Does WordDocDiff work with 3rd party Source Control and Configuration Management tools like WinCVS? Make sure you've un-checked 'quick compare', and any 'advanced options'. Then try again. We recently added a feature in which alignment can be adjusted for just this sort of problem. Any comparator is not perfect, so an occasional misalignment will occur. However, you can specify which lines should be aligned. Please see the "View\Adjust Alignment" menu item. We are also currently adding a feature which will allow for the comparing of selected line numbers from both documents. A newly added feature is the comparison of selected rows. Please see the Mini-Diff feature. View the report in HTML, from there, you can print, e-mail, or even save the report results. The HTML report is in color so differences are shown well. From the Report menu, you can customize the report. Be sure that MS Word/Excel is installed and that you can open the file type in question. 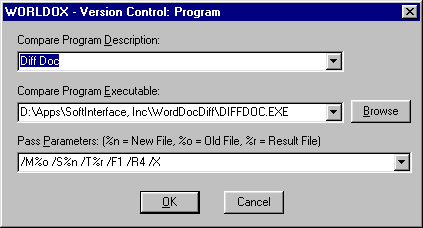 Typically WordPerfect cannot immediately open within MS Word without first installing a module. You can remedy this problem by simply opening up the document type in question within Word/Excel. Word/Excel will prompt you to install the necessary module. Does WordDocDiff work with 3rd party Document Management tools like WinCVS?